Starring Harry Treadaway, Saoirse Ronan, Bill Murray, Toby Jones, Tim Robbins and Martin Landau. Directed by Gil Kenan. Based on the book “City of Ember,” by Jeanne Duprau. The story: in a world on the throes of Armageddon, a group of scientists create a city underground (City of Ember) that will last 200 years. The Mayor of the City is instructed to keep a box that counts down the 200 years and gives explicit instructions on how to evacuate Ember and return to the (hopefully) restored Earth above. Problems ensue when the 7th Mayor of Ember has a heart attack and the box is hidden away. Doon (Treadaway) and Lina (Ronan) are school friends. When the power outages become longer and more frequent, Doon and Lina decide to do something about it while others blindly wait for the Builders to return and fix everything. Doon searches through the Pipeworks and finds secret doors and passages. Lina meets with Mayor Cole (Murray) and fins how corrupt he really is. When Doon finds that his father, Loris, and others tried to escape Ember and Lina finds the instructions to leave, they become suspected of treason. They’re only hope is to find the way out of Ember. 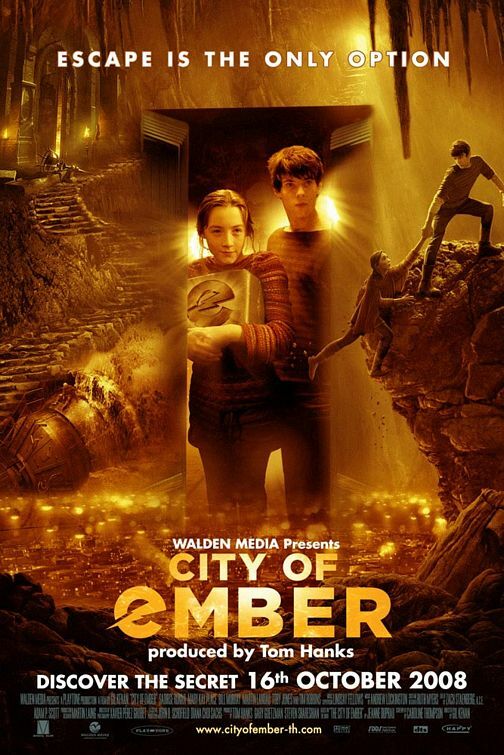 “City of Ember” could have easily been darker and grittier, but it wasn’t. I would say that’s akin to “The Black Cauldron,” or more serious childrens’ fare. My only real complaint about the movie is that I felt it took a while to get to the heart of the mystery, but that’s pittance compared to what the movie delivered. The overall movie was entertaining, engrossing, fun, and it held my attention the entire way. Most impressive to me had to be the set designs. Ember looked like it had been designed somewhere between the 1940’s and 1950’s. And with the fact that the city would be limited in resources, especially after 200 years, it only seemed right that the characters would be wearing hand-me-down-to-the-nth-generation clothing. The city existed in the basement of the Earth, and thus so had small inventions scrapped together from bits and pieces of other objects. The entire civilization was well thought-out. Do I recommend this movie? Sure. There’s no language and relatively no violence. The story is engaging enough to keep the attention of kids and adults. As for what ages should see it, I suggest 6 and up.